Try one of these baby quilt patterns the next time you want to make a quilt for a baby, toddler or older child. The quilt patterns include detailed instructions and step-by-step illustrations, making them suitable for quilters of every skill level. Some of the blocks in the baby quilt patterns have lots of patchwork, so consider starting with a simple design if it's your first quilt. Once you've completed the project, you'll be ready for more. Pretty in Pastels is a baby quilt made from Clay's Choice quilt blocks. Two colorways of half-square triangle units are combined with rotary cut squares to make the blocks. A single border frames the quilt. Pretty in Pastels finishes at about 30 x 42 inches with finished blocks measuring 6 x 6 inches. This simple baby quilt makes a wonderful scrappy project but is every bit as effective when sewn in a controlled color scheme. Each quilt block is assembled from four strip-pieced segments, so putting the blocks and quilt together couldn't be more simple. Choose any theme you like for Little Spinners, vintage-look to contemporary. If you need a larger quilt, simply sew more blocks. Some X's and O's quilts are sewn with blocks butted against each other, and most often the blocks are sewn in only the 'X' configuration. The O shapes truly stand out when the four units in each quilt block are shifted around a bit and then separated with sashing. This small quilt finishes at about 51 x 58 inches with the two borders shown. Make it smaller by eliminating one or both of the borders. To make a project without sashing, take a look at another easy X's and O's quilt pattern. Traditional snowball and nine patch quilt blocks are used to make this 38 x 63-inch quilt. Quilt blocks are placed on-point, and partial blocks are used to fill-in at the sides and corners (rather than plain setting triangles). Your choice of quilting fabrics will determine which elements of the quilt pop out a bit more than others. Try this contemporary baby quilt pattern to sew a quilt that finishes at about 34 x 56 inches, perfect for an older baby or toddler. When you arrive at the pattern, you'll see that the four patch units resting inside the frames are made in two slightly different sizes and that the double frames differ, too. Rail Fence quilts are always easy to sew, and the Rail Fence baby quilt in this pattern is no exception. Quilt blocks are strip pieced using five side-by-side strips of fabric. When you cut the segments apart, you're finished with the blocks. It's that simple. You might spend more time deciding which fabrics to use than it takes to sew the quilt top. Do sew with an accurate 1/4-inch seam allowance and press carefully to avoid stretch. The quilt is difficult to see in this small image, so click through for a better view. This little sailboats quilt is made up of fifteen 8-inch patchwork quilt blocks sewn into horizontal rows and separated by sashing and cornerstones. The example uses the same fabrics throughout, but the pattern would be perfect for a scrap quilt. Taking Flight isn't difficult to sew, but it does require a bit more time to assemble than some of the other baby quilt patterns. A variety of different patches gives you an excellent opportunity to vary the color value—it would make a very nice scrap quilt. Blocks are 6-inch squares and the quilt finishes at about 39 1/2 x 47 inches. Broken Dishes is a traditional patchwork quilt block made entirely with half-square triangle units. 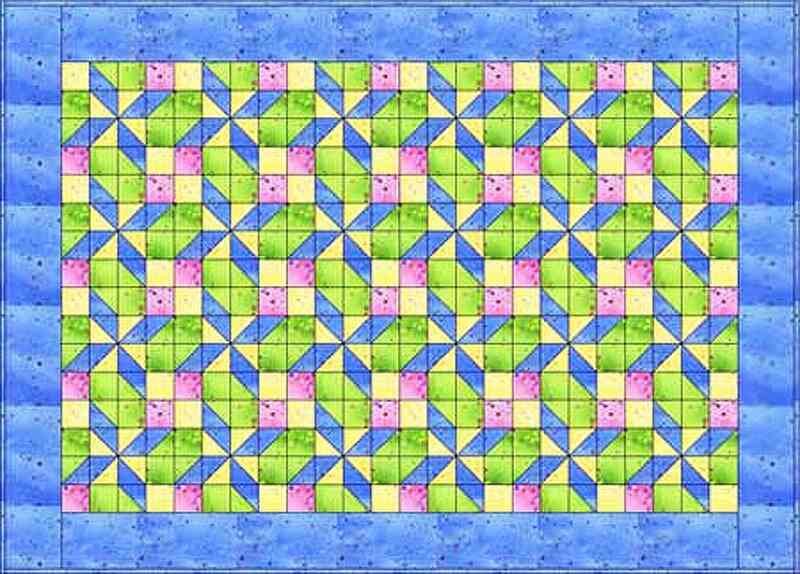 The blocks in this quilt finish at 6-inch square, a nice small scale for a baby quilt or wallhanging. Make a scrap quilt or devise a more orderly fabric arrangement. Overall, the quilt measures 36 1/2 x 42 1/2 inches. This cute baby quilt finishes at 35 x 43 1/2 inches. The Framed Nine Patch Quilt is made from easy nine patch blocks that are surrounded by frames—dark bars on opposite sides and light bars on the two remaining sides. Adjoining blocks are flip-flopped when sewn into horizontal rows, and the change of orientation creates a somewhat stairstep-like appearance. You'll find instructions for two sizes, a bed quilt made with 10-inch square blocks and a baby quilt made with 5-inch square blocks. Here's a baby quilt pattern that measures about 38 x 45 inches. Made with 6-inch square blocks; it's pretty simple to construct. Sashing and cornerstones separate the scrappy blocks, which are sewn in brightly colored, warm patchwork set on a dark brown background. Simply change the color scheme if you'd like to give the quilt a different appearance. This quick baby quilt idea is incorporated into the Single Irish Chain quilt block pattern. Cut alternate squares from novelty fabrics or a pre-printed panel. Both of these easy baby quilts are made from simple squares of fabric. They are a good choice for a first quilt, especially if you want to make a baby quilt as a gift but don't necessarily want to invest in all of the tools required to cut and assemble a myriad of patchwork shapes. Vintage Orchards is an easy baby quilt pattern that's made with one simple block but in two color variations. When alternated in the quilt, the blocks join together to create a secondary pattern with a subtle on-point look. You can change the quilt's theme entirely and still get the same overall look by focusing on color value, and not color itself. The Framed Nine Patch baby quilt measures about 45 1/2 x 60 1/2 inches—larger than the typical baby quilt—but the design works nicely for toddlers. Traditional Double Star quilt blocks, also known as Hope of Hartford, are used for this project. Each quilt block is made from four identical quarter-square triangle units, one center square, and four rectangles. Blocks are straight-sewn and separated by sashing. At 55 x 67 inches, the quilt finishes slightly larger than most baby quilts—perfect for a little girl or boy to grow into. This quilt block is the Double V design made from large 10 inches squares. The quilt finishes at about 55 x 69 inches. In the Pinks is made from two traditional quilt blocks, Broken Dishes and a variation of the Hour Glass design. Quilt blocks are set on point and surrounded by setting triangles and corner triangles. The quilt illustrated is pastel—choose different fabrics to alter its theme. Blocks finish at 9-inch square and the quilt measures about 44 x 57 inches. Here's a super easy little quilt, called Road Trip for the Route 66 fabrics that are illustrated. To make this strippy quilt, assemble columns of squares, placing rectangles at the ends of a few columns to create the wavelike appearance. The quilt finishes at about 44 1/2 x 50 1/2 inches. Don't forget to browse the quilt block patterns. Many of the smaller blocks are suitable for use in a baby quilt of your own design. All of these patterns are suitable for either a little boy or a girl. Change fabrics in any way to create a brand new theme.